Frame and structural strength: usually we install heavy locks and grills but on weak structures. Friends, install expensive locks on a weak structure are like putting on 100 kg. Muscle on weak bones (there is absolutely no point). So before buying devil locks with bolts for the door, first strengthen the structure of the door, concrete the foundations, install iron base if needed. Iron grill: now the bones are strong one can put as much weight as one wants. 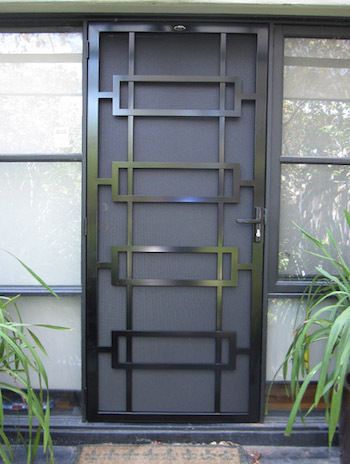 Proper iron grill outside the wooden door is like an antivirus for windows. An iron grill can eliminate the use of CCTV footage (or one can install just to add another layer of security and not for main security). Since the grill carries a lot of weight one must be aware of the weight capacity of the structure of the foundation. Diamond stainless steel grill and decorative grills of strong material are also available as an option of security. If the place of the house or office is near sea, salty water area then corrosion may destroy the iron badly, one can install aluminum to avoid the frame from salty water and snow. Locks: now comes the last part which usually we consider as the first one. Try to buy an expensive good quality lock. There is a wide range of options available which can secure almost any door, but again the structural strength is necessary which can bear a heavy weight lock for example: a heavy door lock could be an 80 mm. lock body, steel shackled and which can only be opened with a uniquely designed coded key (this lock exist in real just to add the information). Further locks can be selected for different purposes, for big doors, warehouses doors, garage doors, floor doors, sliding doors. Security is guaranteed, these days there are android locks are also available which can only be unlocked by the owner’s finger print. How To Design Your Home Office?